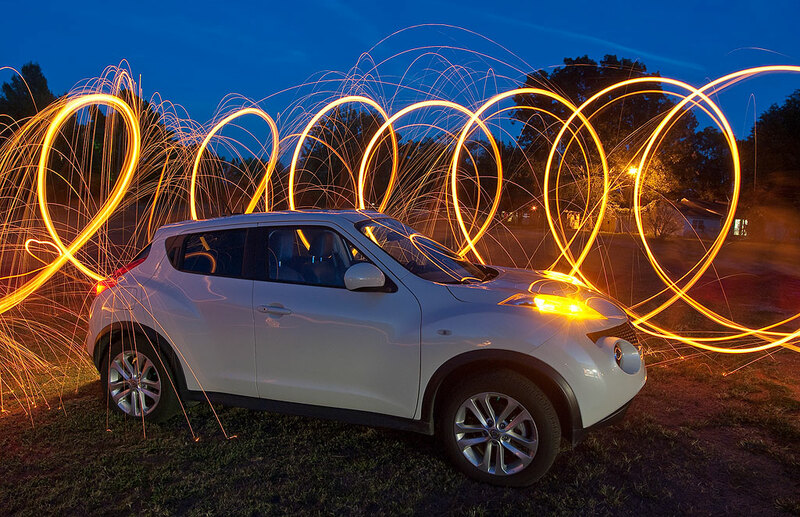 Special effects photos always make more sense to the audience if we put something in them, like a mountain, a silhouetted fence, a camping tent, or, in this case, my car. I am a little late to this party, but it’s still a neat trick, one I finally tried last night: lighting steel wool and photographing it. Between the steel wool, the whisk, and some wire, this whole project cost about $3. The finest-grit steel wool you can buy. I found mine, labeled #0000, in the paint department at Wal Mart. A large whisk, preferably with a handle or loop on the end, with a piece of string or wire tied to the loop. An ignition source like a lighter. I use the long ones that are made to light a grill or camp fire. A large, open area where it is safe and legal to have an open fire. Some way to safely extinguish the fire and deal with hot embers. A tripod and a camera with a controllable shutter capable of an exposure of at least 15 seconds. 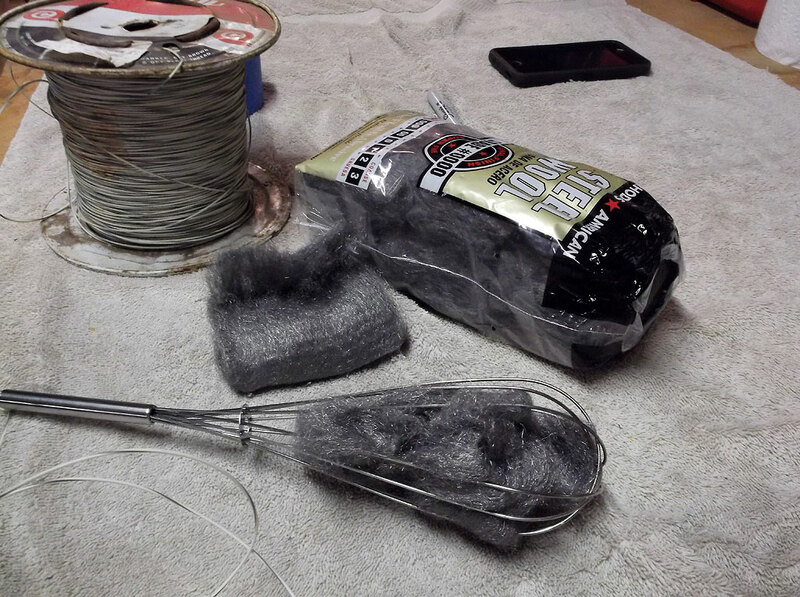 Unroll a pad of steel wool and fluff it out, then push it through the openings in the whisk. The looser the steel wool, the better it will burn because more oxygen can get to it. 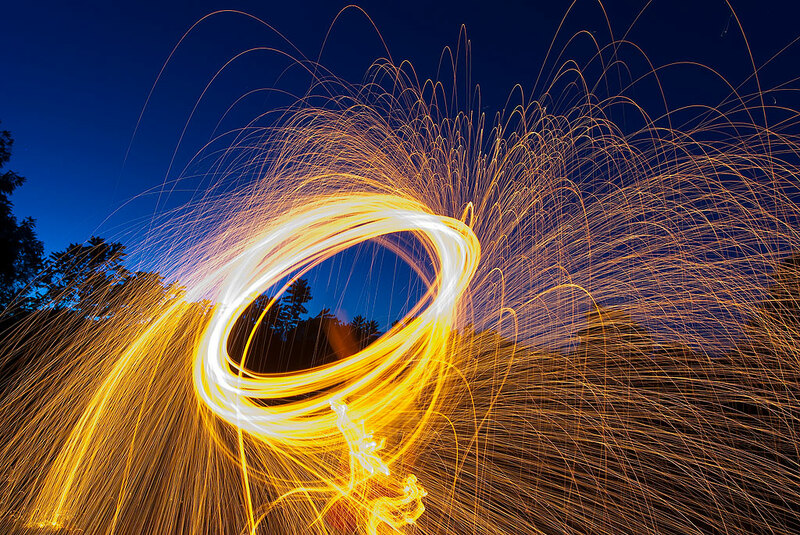 The idea is to open the shutter and light the steel wool, then move the whisk with the burning wool inside to “paint” with the light its fire creates. Most internet tutorials recommend spinning the whisk, since it will move through the air faster and burn brighter and because it throws off neat-looking sparks. It did that last night and liked the results. Working in the dark with an unpredictable medium like burning metal is slightly dangerous, which is why I wore work gloves and a hat. Coordinating shutter opening and lighting the metal is awkward too, since it doesn’t always light right up, and since brightness of the surroundings and the burning metal vary. These images were made with a 15mm lens at f/16, ISO 200, for 30 seconds. I only tried about five pads of steel wool last night, and this ended up being the best of the bunch. I deliberately made these images at dusk so there would be some color to the sky. Really neat. Thanks for the advice about putting something in the photo besides the light.